Scrap automobiles make up a large portion of steel sent for recycling, although our domestic scrap steel such as steel-coated food and drink cans, old pots and pans, and even wire mesh can all be recycled. Scrap steel can be recycled after preparation in a steel processing plant where the steel is separated from the rest of the materials before being sent for remelting and casting to ingots. This is carried out at a steel smelter or a specialized plant using an electric furnace. This is an article on how steel is recycled and includes a detailed description of the effects of recycling steel on our environment. 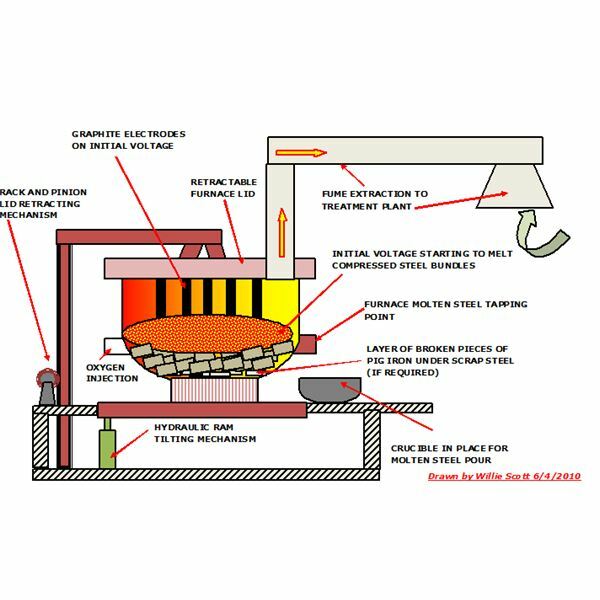 We begin an examination of steel household items and automobile parts, and an overview of their preparation for remelting using a modern electric arc furnace. The environment benefits greatly in the recycling of scrap steel which uses only 25% of the energy expended in the primary production of smelting iron ore. Recycling steel provides further environmental advantages in saving valuable resources; as for every ton of recycled steel produced precludes the mining and processing of almost two tons of iron ore. This leads to a large reduction in the usage and pollution of water and land. The efficient melting and casting of recycled steel in an electric furnace coupled with its effective fume and dust extraction and treatment, drastically reduces air pollution, so hopefully this detailed description of the effects of recycling steel will encourage an increase in recycling steel. There are many items we use every day that are made from steel and are recyclable. I have listed some of the more common ones below, along with any treatment requirements before being sent to a remelting facility. Kitchen Appliances – washing machines, dishwashers, stoves, refrigerators, freezers and microwaves have their electrical motors and wiring removed. Galvanized steel items – no further treatment; the galvanizing is evaporated during melting. Steel beverage and food cans – Some soft drink cans such as Coke and Fanta are made from aluminum, so all the cans are passed under magnets which remove the steel cans, the aluminium cans being stored separately. Steel beverage and food cans will have been coated inside with a very thin layer of tin to prevent the steel from corroding which is removed before melting; the tin being sent to a specialist recycling plant. All the scrap steel is then gathered and compacted into steel cubes and transported to the specialist steel remelt facility. When automobiles have been at the scrapyard for some time, all the popular spare parts will have been stripped and sold so the rest of the vehicle can be prepared for compacting. This involves the removal of tires, alloy wheels, engine and air conditioning fluids,gasoline tanks, air bags and batteries. The remaining components are then compacted into a metal cube and sent to a steel processing plant where the cube is shredded and the steel components and alloys are removed. The remainder, comprising of fabrics, foam, rubber, plastics and glass, which make up about 25% of the original automobile, is normally sent to a landfill, being deemed too expensive to separate for recycling. This can be carried out using an Electric Arc Furnace or as part of the Blast Oxygen Furnace smelting process. We shall examine the Electric Air Furnace method as this uses 100% recycled steel. The furnace is a circular steel vessel lined with firebrick which can tilt on its supporting pad. It has a retractable lid containing a set of electrical prongs which when powered, creates an arc between themselves and the scrap, causing it to melt. When tilted, the molten metal can be tapped and poured into a fire proof container and transported to the steel rolling facility. A fume extraction system is attached to the lid of the furnace from where the fumes are directed through a treatment plant. Here the harmful particles are removed along with most of the noxious gases. The dust extracted can then be further processed, leaving just steel particles which are fed back into the furnace. There is also a fume extraction system which draws any fumes and particles from the building containing the electric arc furnace. These fumes are also directed into the fume treatment plant, thus ensuring most noxious fumes and all particulates are removed; protecting the environment, the local population, and the workers, for the microscopic dust particulates are carcinogenic when inhaled. Please continue reading to see the effects of recycling steel has on the environment. Energy – Only 75% of the energy required to smelt iron ore is used in recycling scrap steel, saving electrical energy. Resources – The quantity of water required in recycling steel is greatly reduced, as washing and enrichment of the iron ore is not required. Landfill savings are made by the public when recycling their domestic scrap steel and further land savings being made in the extraction and processing of the ore. For every ton of steel recycled, nearly two tons of iron ore is saved, which means a reduction in the land to store the tailings of unwanted minerals and gangue. The decrease in iron ore extraction allows further significant savings in land usage possible, especially if an open cast method is used. Reduction of coal and limestone, which are used in the blast furnaces, also result in significant land savings during their extraction and processing stages (similar to iron ore above). 2. Construction Industry – Many new houses and commercial buildings are being constructed using recycled steel for corrugated roofing, structural steel girders and beams, all of which at the end of their life are 100% recyclable without any detrimental effects on the base metal. Water and Land Pollution – Iron ore extraction and processing pollutes the surrounding area through acids leaching into the ground and fresh water supplies such as aquifers, rivers and lakes. Recycling produces 70% less water pollution by reducing the quantity of iron ore extracted and processed. Air Pollution – Overall savings of over 80% in air pollution are achievable by recycling steel against the primary smelting from iron ore. 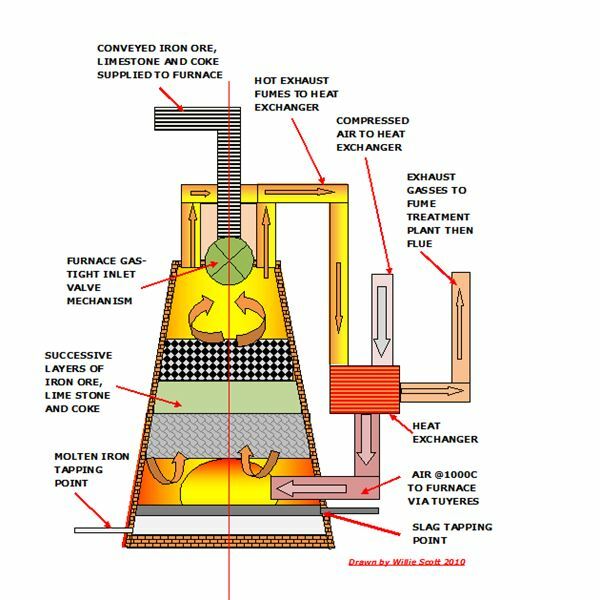 Recycling steel using an efficient Electric Arc Furnace which incorporates a fume treatment plant, extracts most of the noxious fumes and particulates from the molten scrap steel. However, not all the pollutants are removed. Some materials left in the scrap steel, such as plastics and foam from automobile recycled steel, can create noxious fumes. These fumes can be emitted into the atmosphere and are currently under investigation by government environmental agencies. This pollution and subsequent legislation would not be necessary if more effort was employed in removing the plastics and foams at the materials sorting stage, before the remelt process. This article gives a description of the effects of recycling steel, setting out the different stages of how steel is recycled and how we can all play our part in recycling scrap steel while providing a much needed benefit to our environment. Recycling household steel is more than collecting the steel cans used as drinks and food containers. We can take other items such as kitchen appliances, pots and pans, old bicycles, iron patio furniture, and galvanized corrugated sheets to a recycling center. When your old trusty automobile reaches that stage where repair is costing more than it is worth, take it to the scrapyard. Here it will be sent for recycling and the steel reused for items as diverse as steel drink and beverage cans, steel beams and corrugated roofs on new buildings. There are numerous environmental benefits of recycling steel compared to primary steel production. These include a large savings in resources of energy, land and water, along with a substantial reduction in air, water and land pollution. 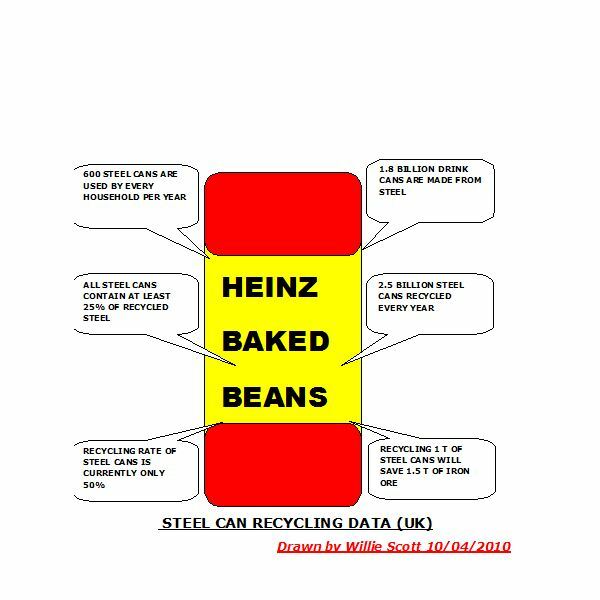 So the next time you see someone chucking out an empty soup can, tell them about the different effects recycling steel can have on our environment.